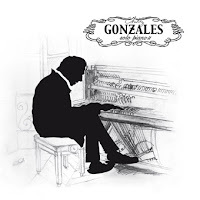 Snob's Music: Chilly Gonzales to release "Solo Piano II"
Chilly Gonzales to release "Solo Piano II"
Chilly Gonazales may forever be best known for his production of the breakthrough Feist albums, but he has had a long and fruitful career of his own. That career continues with his forthcoming album Solo Piano II. The album, which comes out on August 28th, is a follow-up to his original Solo Piano, an album of well, compositions played solo on a piano.